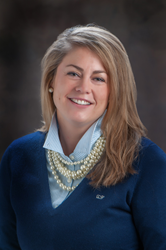 Courtney Veirs Bouloucon recently joined the ResortQuest Real Estate team in Coastal Delaware. ResortQuest Real Estate is proud to announce that Courtney Veirs Bouloucon recently joined the firm's West Fenwick office, located on Route 54/Lighthouse Road, as a sales associate. Bouloucon has worked in the real estate and home building industry for more than 14 years. Bouloucon brings extensive knowledge of the real estate market, customer service, and home building to her position as a real estate agent; and is committed to offering her clients an outstanding level of service. Bouloucon grew up in suburban Washington, D.C., and moved to the beach eight years ago from Annapolis, Md. She routinely vacationed with her family at Sea Colony and it was those vacations that eventually led her to make this area her permanent home. She has a bachelor’s degree from Salisbury University and is a member of the Kappa Delta Pi Education Honor Society. Bouloucon lives in Frankford, Del., with her husband, Marc, and son, Samuel. Bouloucon will specialize in listing and selling residential and vacation homes, lots and land on the Rt. 54 corridor and the surrounding areas. She is an active member of the National Association of REALTORS®, Delaware Association of REALTORS® and the Sussex County Association of REALTORS®. Bouloucon's office is located at 37458 Lion Drive #7, Fenwick Plaza on Rt. 54 and she can be reached at 302-541-5816. For the latest on real estate in the resort and inland areas of Sussex County, visit the firm's locations at 33012 Coastal Highway or call 302-539-8600; Marketplace at Sea Colony at 33546 Marketplace or call 302-541-8999; Edgewater Lobby at L1- Edgewater House Road or call 302-537-8880; West Fenwick at 37458 Lion Drive, Suite 7 or call 302-436-1100; or Bear Trap Dunes at 21 Village Green Drive or call 302-541-5454. ResortQuest Real Estate can also be found on the Web at ResortQuestDE.com, on Facebook (/RQDEMD), or on Twitter (@RQDEMD). For information on starting a career in real estate, contact Taylor at 302-541-8780 or visit http://www.ResortQuestDE.com. ResortQuest Delaware Real Estate, LLC, a subsidiary of Wyndham Vacation Rentals North America, LLC, has provided real estate sales, vacation rental, and homeowner association management services to Bethany Beach, Sea Colony and other fine communities in Delaware's Quiet Resorts, Maryland and the surrounding coastal areas since the early 1970s. Its affiliate ResortQuest Delaware, LLC’s homeowner association management division represents the needs of more than 6,200 homeowners in 47 associations from Lewes to Fenwick Island, Del. Wyndham Vacation Rentals®, the world’s largest professionally managed vacation rentals business providing access to more than 100,000 vacation rental properties in over 600 unique destinations worldwide, is part of Wyndham Exchange & Rentals® and the Wyndham Worldwide family of brands. For additional information, visit our media center or wyndhamvacationrentals.com.